The rumor mill is overflowing with talk of a bigger screen on the next iPhone, a screen with a wider aspect ratio. There's also a lot of chatter about a new connector, potentially with fewer pins. An important question was often overlooked though - does iOS actually support these things? 9to5Mac dug into the iOS Simulator and nudged the resolution to 640 x 1136, the rumored resolution of the iPhone 5 (which, if the screen is 4" as rumored, will keep the pixel density close to the current values and move to a 16:9 aspect ratio). 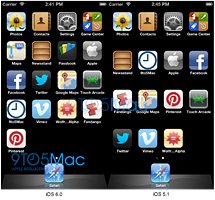 The Simulator for iOS 6 adjusted by display five rows of icons on the screen, instead of the usual four rows. This is a new feature too, as iOS 5.1 displays only four rows at the same resolution (it just adds blank bars). It's even more telling that the iOS 6 Simulator doesn't handle other resolutions that well, adopting an iPad-like layout, instead of an iPhone one. This would suggest that the 640 x 1136 is treated specially - to accommodate the new iPhone perhaps? It's a shame they didn't try any apps to see how they handle the scaling. Another interesting thing found while digging in the iOS 6 innards is a "9Pin". The reference is just a constant in a list of supported features, but it's easy to see how this might be about a 9-pin dock connector (instead of the current 30-pin connector). However, rumors usually point to a less drastic reduction in pin count - 19 pins. Of course, both of these things can mean something completely different, be part of a prototype that never leaves Apple's labs or even just a misdirect. The only way to know for sure is to wait for the official Apple announcement, which will supposedly take place on September 12. Thats right! Ford is the best because it was first!